Please email lce29@cornell.edu to be featured on the next edition of the A-List. Submissions are due on Fridays at 11:59p EST. Anything submitted after this deadline will be on the following week's edition. Register at https://cornell.qualtrics.com/jfe/form/SV_dmNIKa80cUgfJ5z . Organizations must send a representative in order to be in good standing for ALANA Funding for the Fall 2017 semester. Dr. Renee Alexander as NEW Senior Advisor to the Dean of Students! I am excited to announce that Dr. Renee Alexander will now be serving as the Senior Advisor to the Dean of Students on issues of campus climate. In this new role, Dr. Renee will work closely with the Dean of Students, Dr. Vijay Pendakur, on shaping a student climate at Cornell that is engaged, equity-minded, and committed to free speech. Dr. Renee will also continue her Breaking Bread programming series, while identifying new opportunities for inter-group exchange and dialogue across difference. Please come visit Dr. Renee at her new office in 401 Willard Straight Hall, and her satellite office in 221 RPCC! 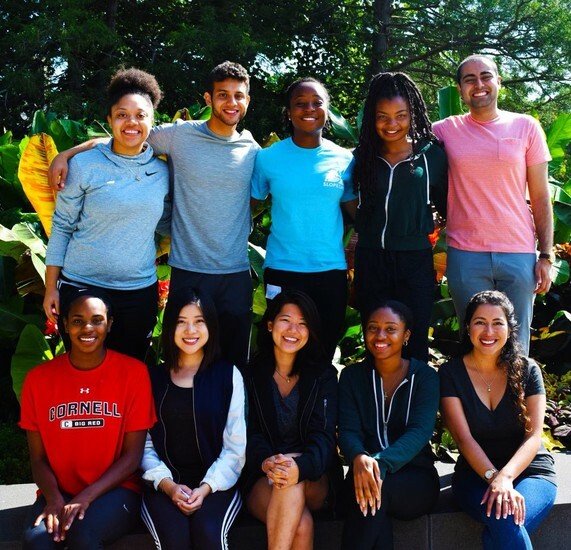 During this transition, Sophie Sidhu has stepped into the role of Interim Building Director of 626 while she will also maintain her role as Director of the Asian and Asian American Resource Center (A3C). For now, please do e mail Dr. Renee to schedule an appointment and see where and when you may be able to meet with her. There will no longer be ALANA general body meetings. 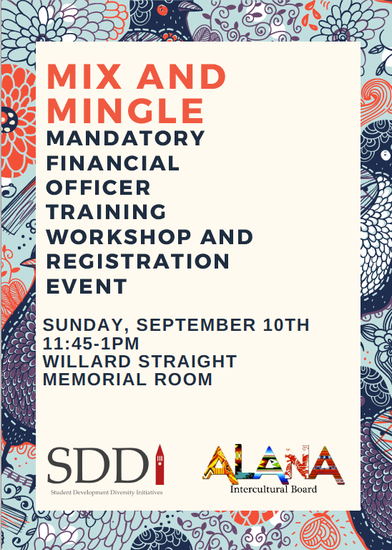 To replace them, the umbrella liaisons will create ALANA Meetings that are for members to attend and they will focus on different topics in their respective multicultural communities. Stay tuned for upcoming events! Auditions for Performing & Media Arts' upcoming productions will take place on Tuesday, August 29, 2017 at 7pm in the Flex Theatre, Schwartz Center for the Performing Arts. Please prepare a one-minute monologue. Callback will take place on August 30 & 31, 2017. Questions? 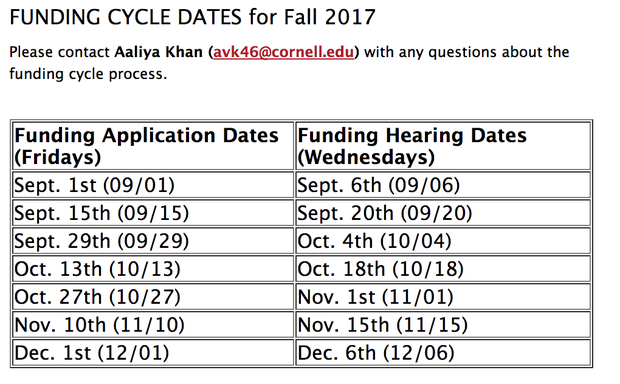 Email Pam Lillard at psl1@cornell.edu. Are you interested in the Local Migrant Community, Advocacy, and effective Service? FOF seeks to provide consistent English as a Second Language (ESL) Instruction to local dairy farm workers. Cornell students are provided the opportunity to teach ESL while learning more about the conditions of migrant workers. For more information about these E-Board roles and how you can work to improve the lot of Farmworkers simply click on the link below and read the descriptions attached. APPLICATIONS ARE DUE AUGUST 28th! Thanks and have a great Semester! On September 15, 2017, the MiSK Foundation and UNDP are hosting a global youth forum, bringing together high-achieving young people to discuss how tolerance can be used as a tool for achieving peace and the Sustainable Development Goals. The event will also address UN Security Council Resolution 2250, which urges member states to increase representation of youth in decision-making at all levels. Location: Sept 15, The Plaza Hotel located at 768 Fifth Avenue, New York, New York, United States 10019. 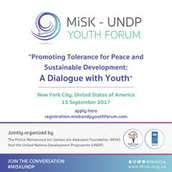 If you would like to participate, please submit your application at https://registration.miskundpyouthforum.com/ under “Youth Applicants.” All applications will be reviewed by the organizing committee. If accepted, you will receive a final confirmation via email. MiSK is a foundation focused on youth, education, and culture, based in Saudi Arabia, and Chaired by the Crown Prince – HRH Mohammed bin Salman. The United Nations Development Programme (UNDP) is the United Nations' global development network, advocating for change and connecting countries to expert knowledge and resources to build a sustainable society. If you have any questions, we’ll be happy to answer them at registration@miskundpyouthforum.com. Acceptances are made on a rolling basis. Therefore, we strongly suggest you fill out the application as soon as possible to ensure there are available spots to apply for. When will I be notified of my acceptance? All applications will be reviewed by the organizing committee. Once a decision has been made, you will receive a final response via email. What will I do at the event? Participate in interactive workshops, network, brainstorm ways to build a tolerant and sustainable society, and listen to an amazing group of inspirational speakers. Are you currently a sophomore looking for an internship? Are you confused about the process, want to hear about great companies to consider, or just don't know where to start? Come to Delta Sigma Pi's annual Sophomore Summer Internship Panel! Hear from our brothers about their diverse internship experiences after their sophomore year, and receive resources for your job search. There will be opportunities for specific questions both during the panel and afterwards, as brothers will remain to network and chat. Students of all ages are welcome to attend! Casual dress is encouraged and there is no registration required for this event. We look forward to meeting you soon!